Hiya crafty peeps! It's time for a new digi release over at Some Odd Girl and this week we've got the amazing Amazon Mae! Isn't she awesome? She was a blast to color and I can just see her being perfect for so many occasions. 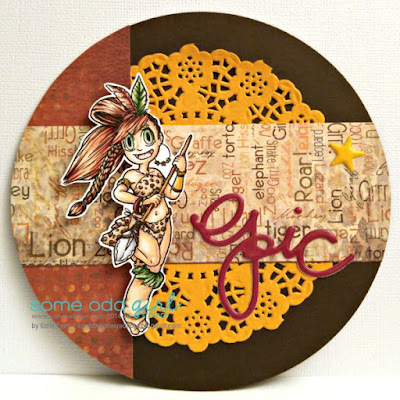 The instant I saw her I knew exactly what papers I wanted to pair her with- the Bo Bunny Zoology collection from a few years ago- they just seemed to be the perfect fit- and then I went for the out-of-the-box circle card and an over sized word sticker that just seemed to fit perfectly. I hope that you love Amazon Mae as much as I do! Make sure to check out some more amazing inspiration over on the Some Odd Girl blog- and if you already know you're ready to grab her up for yourself you can find her in the SOG shop :) Thanks so much for stopping by to visit me today!